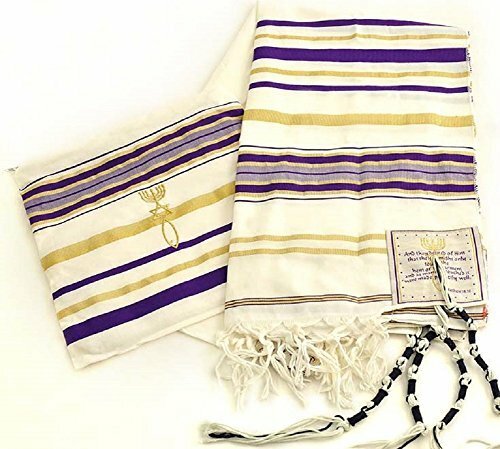 Prayer Shawl designed with the main center Christian prayer in Hebrew letters. Made of Acrylic and is 72" long and 22" wide Comes in a bag with zipper from the same material of High Quality. All corners contain the white and blue thread and is made of Cotton. The Four prayers placed on the four corners are In English. Like any new clothing item, the tallit might have slight discoloring and/or smell from storage. Please wash before first use. Prayer Shawl designed with the main center Christian prayer in Hebrew letters. Made of Acrylic and is 72" long and 22" wide Comes in a bag with zipper from the same material of High Quality. Top quality Messianic Tallit with bag. Blessings.